A classic. 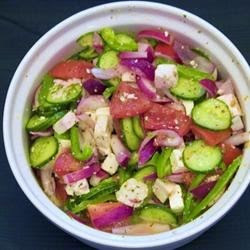 Tomatoes, olives, feta, peppers, onions and cucumbers, all sliced, chopped and waiting to be tossed with a great dressing. This recipe has one - red wine vinegar, olive oil, lemon juice and herbs. Toss and enjoy.